Allows you to run software faster than it was originally designed for. 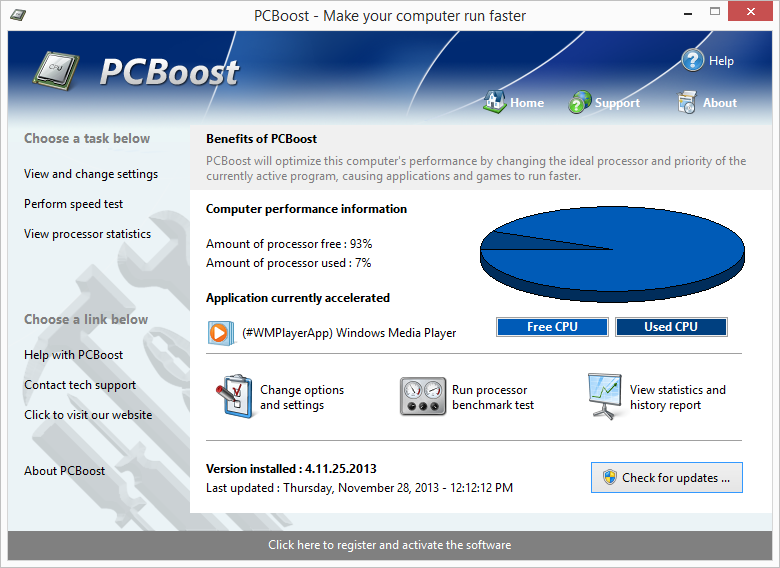 PCBoost 5.10.31 was available as a giveaway on November 25, 2016! 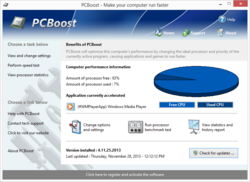 How would you improve PCBoost 5.10.31? 1) Get a SSD drive and put only Windows, plus only software that needs to be installed on the system drive, on it --- install all other software on another regular hard drive also on the pc, and remap all your user libraries to store on the regular hard drive. 2) Get more RAM, make sure to get 2 x RAM modules instead of one larger one, as these work together to boost speed. 3) Get a graphics card, even if you're not a gamer, even a cheaper one will also take a lot of pressure off the main CPU. 4) Last would be to get a newer and faster CPU, but at this point you may have to upgrade your motherboard, so the above 3 will already give you a HUGE boost in speed. For example : I have an old 2013 Asus Transformer T100 laptop/tablet, which has Windows 8.1 on an integrated eMMC chip (functions like a SSD), with only 2 GB RAM and an average Pentium processor, but it runs like lightning, even with Chrome and 50 open tabs. I have plugged it into my large screen and full size wireless keyboard - it can practically handle almost anything I throw at it. That's all due to the eMMC /SSD -- even if you change just one component, start with a SSD. If you want your pc/laptop to run faster, forget about this kind of software (unless your pc dates from the 90s, when it may possibly help you), rather do the following : 1) Get a SSD drive and put only Windows, plus only software that needs to be installed on the system drive, on it --- install all other software on another regular hard drive also on the pc, and remap all your user libraries to store on the regular hard drive. 2) Get more RAM, make sure to get 2 x RAM modules instead of one larger one, as these work together to boost speed. 3) Get a graphics card, even if you're not a gamer, even a cheaper one will also take a lot of pressure off the main CPU. 4) Last would be to get a newer and faster CPU, but at this point you may have to upgrade your motherboard, so the above 3 will already give you a HUGE boost in speed. For example : I have an old 2013 Asus Transformer T100 laptop/tablet, which has Windows 8.1 on an integrated eMMC chip (functions like a SSD), with only 2 GB RAM and an average Pentium processor, but it runs like lightning, even with Chrome and 50 open tabs. I have plugged it into my large screen and full size wireless keyboard - it can practically handle almost anything I throw at it. That's all due to the eMMC /SSD -- even if you change just one component, start with a SSD. Я хотел бы видеть программу, которая позволяет мне легко подрезать то, что работает при запуске, устанавливает задержку для тех, которые используют больше ресурсов, и позволяет мне сделать заказ программное обеспечение безопасности для запуска сначала при запуске, перед другими утилитами и подключение к сети. Дайте мне что-то подобное, и я дам ему кружить. Judging from all the warnings concerning this type of program, I think it would be wise to say "Thanks, but No Thanks!" this is just a sugar pill But if you want to have more power there is only one way UPGRADE YOUR PC ! "Thought I'd give this a try out of curiosity and tested it on a couple of programs that are heavy on resources and noted the CPU, RAM and Swap usage before running today's software, then ran them again with the software installed and didn't see any improvement. All this does it is take up disk space. These types of programs are pointless as Windows does a good job of managing resources on it's own. Uninstalled. Did you find this comment useful? yes | no (+27)"
In windows, the foreground software is limited to the DRAM speed and available memory after all of the background software is loaded and run, not the CPU. The CPU is like a turning wheel refreshing and dedicating the CPU time slices according to the priorities in the registers. It is all in balance, if you take time slices from other operating system software or applications, you will actually slow everything to a crawl. If you want to see that in action go to task manager and see how hundreds of background software occupy the CPU and memory allocations. Now disable couple of background software and see your system stops working or almost stops. In other words, the operating system software has priority over foreground software and the CPU time slices are allocated to them first and that is not negotiable. In windows, the foreground software is limited to the DRAM speed and available memory after all of the background software is loaded and run, not the CPU. The CPU is like a turning wheel refreshing and dedicating the CPU time slices according to the priorities in the registers. It is all in balance, if you take time slices from other operating system software or applications, you will actually slow everything to a crawl. If you want to see that in action go to task manager and see how hundreds of background software occupy the CPU and memory allocations. Now disable couple of background software and see your system stops working or almost stops. In other words, the operating system software has priority over foreground software and the CPU time slices are allocated to them first and that is not negotiable. KPG2, Correct and good analogy. In order to free more time slices from the CPU, you have to take it from other applications or OS. What good is fast software when the OS has been slowed downed to a crawl. There will be net loss in speed when you include the alleged software that supposedly will speed up the software. Another snake oil software. While the software might cause a placebo effect that makes it seem like programs are running faster, the truth is the only things that can make your software run faster is the hardware in your computer. I'd like to see a program that allows me to easily prune what runs at startup, sets a delay for those that use more resources, and allows me to order security software to run first at startup, before other utilities and network connection. Give me something like that, and I'll give it a whirl. Therese, There are many applications/programs out there that will do as you want. Heck, you can even do it yourself through windows built in Task manager if you want to take the time. Here's a link to a decent one. 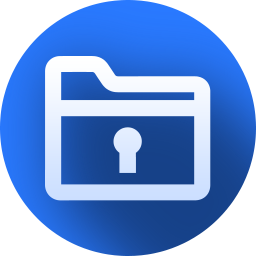 That website you posted is in the readme.txt file inside the zipped file. daniel griffith, That website you posted is in the readme.txt file inside the zipped file. It doesn´t make sence to me. At the moment we have 13 comments: 12 of them have 113 + 1 of them has 1 - <strong>So please GOTD explain the thumbs up thumbs down witch at the moment shows: 22 up 39% 34 down 61% It doesn´t make sence to me.</strong> Thank You for your quick response. Nissepelle, NOT all viewers have to leave comments in order to vote, it is NOT required, some people vote even without trying the software, they can often base themselves on the comments they read here to form an opinion and then they vote so no math can be applied and no logic to follow. I have built a dozen PCs over the years from scratch for myself and friends. I have extensive experience with virtually every home version of Windows, and several server version. I have yet to see one of these applications do anything perceptible. The fact that they are even offered at all seems pretty dubious to me. Oops. Hit the enter accidentally. The software DOES do something very perceptible.... Make Money! (or try). Oops. Hit the enter accidentally. The software DOES do something very perceptible.... Make Money! (or try). All I get is - "The name and serial number you have entered is not correct." Any suggestions as to how I might proceed? Guys and gals be very careful with applets like this one. If you own a Volkswagen Beetle there is nothing in this world that could make it to perform like a Mercedes-AMG GT. If you try additives or gadgets to improve its performance you will end up with a destroyed Beetle. If you think you need a better computer and you don't have the money to grab a new one, then get a faster RAM, a faster disk and/or faster peripherals. Everything else is nonsense. Even the microprocessor replacement is nonsense cause in that case it is better to change the complete motherboard and power supply, in short the whole computer. The tune-up of a computer requires knowledge and expertise not just a "magic" program. Guys and gals be very careful with applets like this one. If you own a Volkswagen Beetle there is nothing in this world that could make it to perform like a Mercedes-AMG GT. If you try additives or gadgets to improve its performance you will end up with a destroyed Beetle. If you think you need a better computer and you don't have the money to grab a new one, then get a faster RAM, a faster disk and/or faster peripherals. Everything else is nonsense. Even the microprocessor replacement is nonsense cause in that case it is better to change the complete motherboard and power supply, in short the whole computer. The tune-up of a computer requires knowledge and expertise not just a "magic" program. Luis, I have to disagree, AVG TUNEUP works, safely. I was the kid who at 16 stupidly put a Judson Supercharger in my Beatle and broke a tie-rod. Robert, tools like AVG TuneUp will be the death of the computer. How does a supercharger for your engine affect a chassis, or suspension, steering maybe part, i.e. "tie-rod"? I could believe a piston rod breaking from the engine stress???? Robert, How does a supercharger for your engine affect a chassis, or suspension, steering maybe part, i.e. "tie-rod"? I could believe a piston rod breaking from the engine stress???? Thought I'd give this a try out of curiosity and tested it on a couple of programs that are heavy on resources and noted the CPU, RAM and Swap usage before running today's software, then ran them again with the software installed and didn't see any improvement. All this does it is take up disk space. These types of programs are pointless as Windows does a good job of managing resources on it's own. Uninstalled. Seen such programs before (Process Lasso) and they all SLOW DOWN your computer by running a program which is supposed to change the priority of CPU tasks. 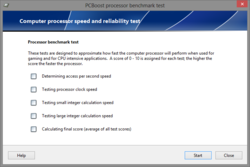 If your CPU is not hitting 100% there will be no benefit from any of these programs. Paul, I agree in general with your post. 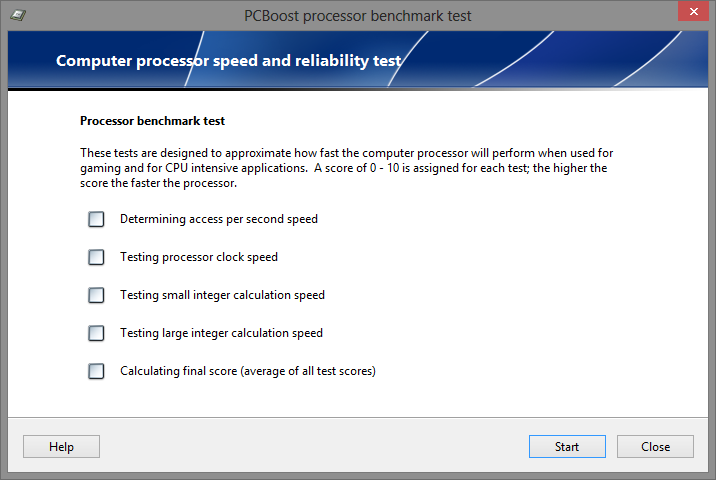 The vast majority of the PC "performance optimizer" apps I have seen are fairly useless. But I don't consider ProcessLasso to be in that group. "ProLasso" doesn't claim to be a magic bullet that allows a PC to run "applications faster" as today's offering does, or "Make your PC run like new", but it does keep resource-hungry or buggy apps from hogging more than their share of system resources, causing everything else to run at a glacial pace, and it helps prevent system lock-ups due to buggy apps causing hangs in Windows' inter-app message queue. I have used ProcessLasso a lot over the years to regulate some of my video trans-coders and other apps to prevent from grabbing 100% of available CPU cycles. I have also used it to keep buggy apps from causing Windows to lock-up and require a restart. And yes, I use it to give my flight sims priority access to system resources while I'm "flying". These are the types of operations ProcessLasso was designed for: giving power-users more granular control over their applications' use of system resources. Paul, I agree in general with your post. 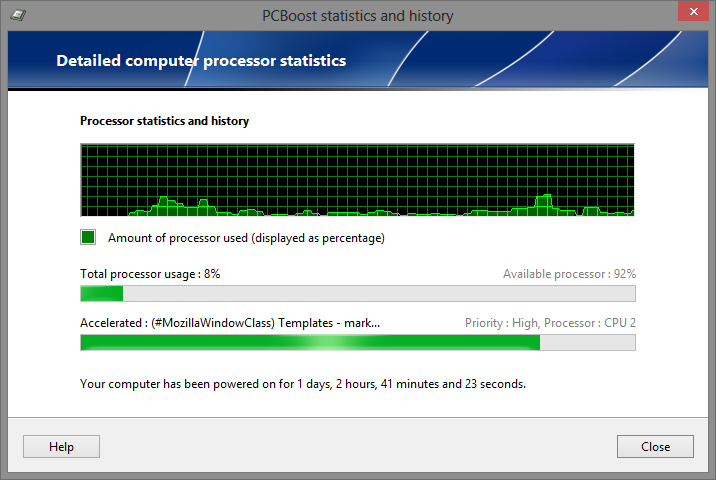 The vast majority of the PC "performance optimizer" apps I have seen are fairly useless. But I don't consider ProcessLasso to be in that group. "ProLasso" doesn't claim to be a magic bullet that allows a PC to run "applications faster" as today's offering does, or "Make your PC run like new", but it does keep resource-hungry or buggy apps from hogging more than their share of system resources, causing everything else to run at a glacial pace, and it helps prevent system lock-ups due to buggy apps causing hangs in Windows' inter-app message queue. I have used ProcessLasso a lot over the years to regulate some of my video trans-coders and other apps to prevent from grabbing 100% of available CPU cycles. I have also used it to keep buggy apps from causing Windows to lock-up and require a restart. And yes, I use it to give my flight sims priority access to system resources while I'm "flying". These are the types of operations ProcessLasso was designed for: giving power-users more granular control over their applications' use of system resources. - Best of Luck! "Allows software to run faster than it was designed for". Eh???? Windows own Task Manager quickly allows anyone to modify an app's CPU allocation via the set priority or set affinity controls. Do not use this kind of Software.Windows does everything you need properly. Windows is a relatively inefficient OS compared to Linux or MacOSX (Windows keep hard drive manufacturers happy!) but I agree - this kind of software just doesn't work. Chris, This is more true if you compare Mac OS with earlier versions of Windows, before Windows 7. But I have to say that some operations in video related software can be done faster in Mac OS, on the same hardware, and I think it's because some mac software are better optimized for Mac, so it works faster, and their Windows versions aren't very optimized for Windows. Chris, This is more true if you compare Mac OS with earlier versions of Windows, before Windows 7. But I have to say that some operations in video related software can be done faster in Mac OS, on the same hardware, and I think it's because some mac software are better optimized for Mac, so it works faster, and their Windows versions aren't very optimized for Windows. I doubt that this will help to boost anything in the case of using old Photoshop cs2 on windows XP with 1GB RAM. Upgrading hardware is the only way to real boost. Was going to give this a go, but it contains the .gcd file, which means I have to restart in safe mode, install, then restart again to try this stuff out. I've complained about this before, so I won't be trying it. Audiomonk, the maker provided an older version oif his software and Giveawayoftheday wrapped that into the .gcd file to protect his interests. So the front door is locked professionally. But the maker gives you a key that is accepted by his trial. So the back door is wide open. You can test today's software by using the official trial and your name and key. Only one word - Snakeoil ! Quote: Allows you to run software faster than it was originally designed for. Quote end: Only one word - Snakeoil ! Black5, That should be two words. Yep, I agree, snake oil like engine rear oil seal stop leak. Want software to run faster?, turn off unneeded background process hogs, depending on if the software is a computer based or net based, clear cache, go to website of mobo mfg, know what your processor is capable of, add ram if mobo supports it, check bios version I had to change the bios of a Dell laptop to be able to double its capacity to read it. If you can overclock in the bios, READ the mobo book, if not confident, go to Extreme Tech, Tom's Hardware, etc. heh, is snake oil poisonous to computers? Black5, Yep, I agree, snake oil like engine rear oil seal stop leak. Want software to run faster?, turn off unneeded background process hogs, depending on if the software is a computer based or net based, clear cache, go to website of mobo mfg, know what your processor is capable of, add ram if mobo supports it, check bios version I had to change the bios of a Dell laptop to be able to double its capacity to read it. If you can overclock in the bios, READ the mobo book, if not confident, go to Extreme Tech, Tom's Hardware, etc. heh, is snake oil poisonous to computers? Having said that... I have not used this program nor do I wish to... but if you feel confident, then do so... and good luck. I have used software like this in the past, it turns unused windows services off... I don't know about this software, but the one I used nearly destroyed my windows 7 ultimate. So I urge caution, beware all ye who enter here... Having said that... I have not used this program nor do I wish to... but if you feel confident, then do so... and good luck.